Just discovered LibraryThing. 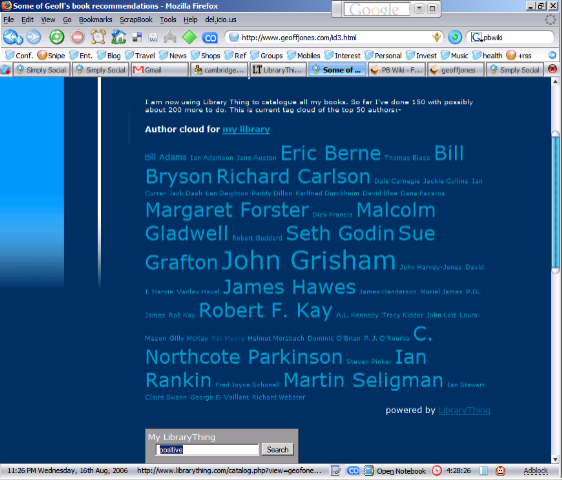 Fantastic site that allows you to enter all your books by ISBN number or author and title. First 200 books are free to enter (I'm now at 150) and I would say at least 300 more to go. The really cool thing is that you can generate clouds either by tag, author etc. 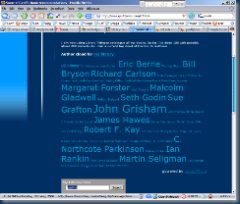 This is a tag cloud of my top 50 autors todate. It also generates a widget that you can put on your website that enables anyone to search my library. My widget is on my books page. Other features let you see how many other users have the same books as you and suggestions based on your current profile. As always the hardest part is working out what tags to use. Maybe after I have finished reading Ellee's present "Women Fire, and Dangerous Things by George Lakoff" - What categories reveal about the mind. I might be wiser, although it has to be said its a seriously heavyweight book. Ze Frank sums up the situation..
Write to your MP (Hard copy only) please.